Here's to the future of Star Wars! C'mon, admit that you laughed when you first saw the awkward soccer ball droid zipping by in the new Star Wars trailer. I wanted at least one of my Rebel Challenge costumes to be something that was forward-looking - so why not run as a giant ball robot? 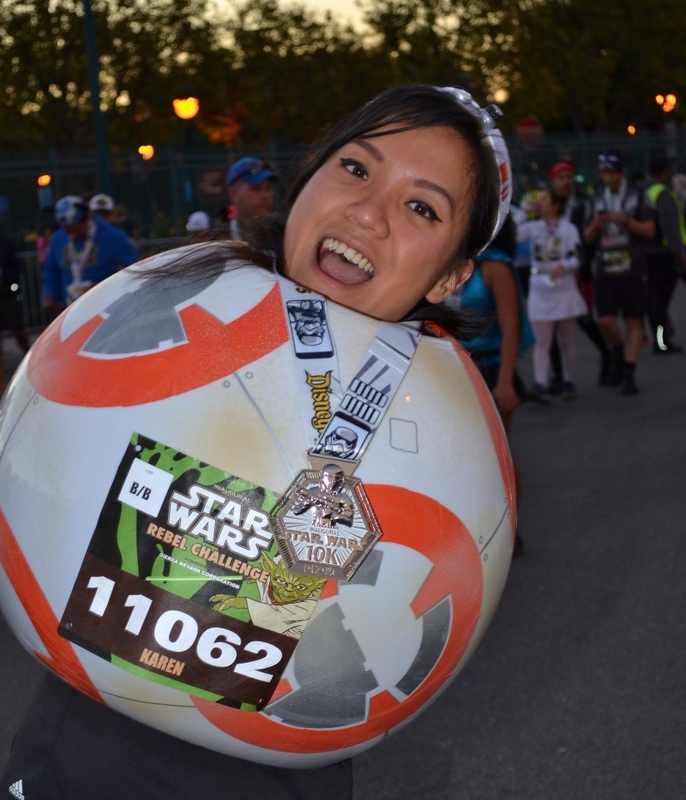 Special thanks to my friend Amy who drove BB-8 from Norcal to Anaheim. I would've had to ship it. The engineering for this costume took me a really long time to figure out. First I had to figure out what to use to make the ball body. I experimented with oversized Chinese spherical accordion-style paper lanterns. No dice. I admit that I was being a bit picky - I wanted the body to be smooth, and not look like it was pieced together. I luckily found an oversized white acrylic sphere (used as lighting fixture). I sawed and sanded a hole for my head, and a hole for my body. I eyeballed the outer pattens and cut them out of adhesive acrylic sheets (kind of like a large sheet of decal sticker). I sanded the outer surface randomly to tone down the plastic gloss and to give it a more matte, worn look. Then I used beige spray paint to give it the weathered, dusty effect. Now, everyone's burning questions were: WHY DIDN'T YOU HAVE ARM HOLES? HOW CAN YOU RUN WITHOUT MOVING YOUR ARMS? If I made arm holes, I would've had to run with my arms propped up due to the wide shape of the sphere. It really wasn't that bad running like that. I braced the sphere from the inside with my hands. The best part was after the race because I was able to horde a lot of the post-race snacks and Powerade bottles in my ball.